The period covered initially by Arts:Search is 1916- 1925. Available now. Two issues a year (1916-1919); from 1921 quarterly. 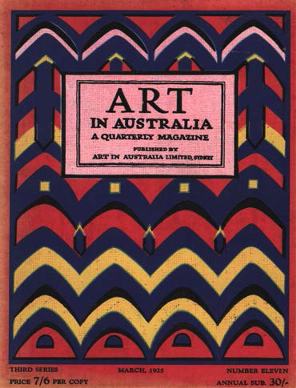 Art in Australia was the first significant art journal to be published in Australia and is now very scarce. We have digitized the first ten years of the journal (1916-1925) in its entirety, including the advertisements. Each issue of the journal has approximately 100-pages, however, it was not paginated. The fact that it is so scarce and is not paginated, probably accounts for the fact that articles from this journal are seldom cited. In digitizing the journal, we have added pagination (assuming the title page to be page 1). As with all the journals digitized by Arts:Search, we have added biographical information on all the artists whose work is discussed or illustrated in Art in Australia, giving the full name and gender of the artist, together with a supplementary bibliography and Internet links.